You know, everyone needs to back off Barry Bonds. We have this thing in the U.S. called "innocent until proven guilty." And yet, all these folks just assuming he's guilty of using steroids and lying about it. He's never been proven guilty. In fact, he's never tested positive for steroids. You know, I really don't know if he's used steroids or not. He says he never knowingly used steroids. How can anyone prove otherwise?? What ticks me off is Mark McGwire and others under oath denied using, so why aren't they being indicted as well?? Why is it only Bonds who is being called to question? Maybe it's race, I doubt it. So what if he's not good with the media? That's no reason to take away his record. I'm not particularly a huge Barry Bonds fan, but leave the guy alone. He's devoted his entire life to the game of baseball. How can people take that away from him? How can they blot his record and his name from the books?? I don't get it. Like I said, he NEVER tested positive for steroids. There's absolutely no proof he's knowingly used them. Give him some peace and let him enjoy playing the game. 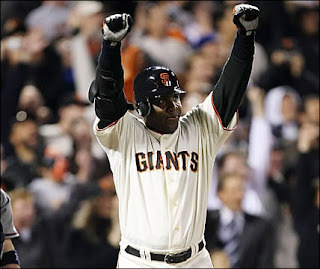 I hope he continues and keeps knocking them out of the ballpark and adding to his homerun record.